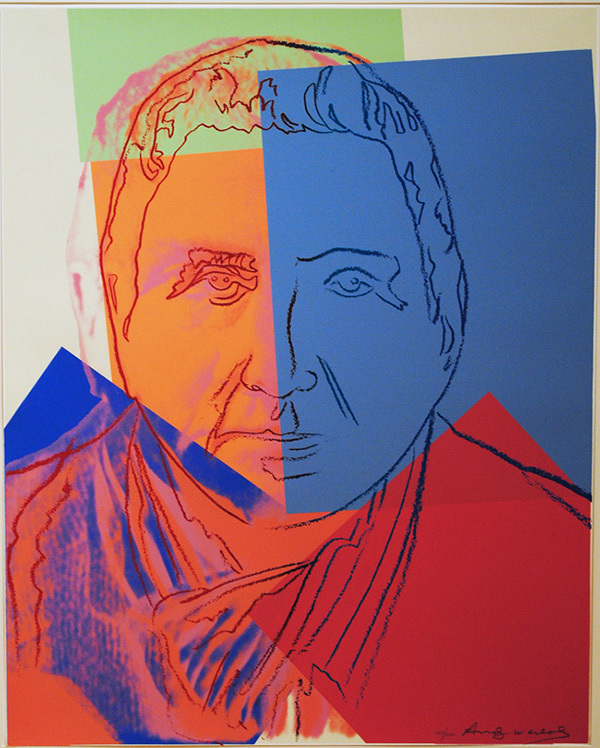 Warhol’s portrait of poet Gertrude Stein might appear a surprising selection to some but it would be difficult to imagine modernism during the first half of the twentieth century without the presence of Gertrude Stein as it would be difficult to discuss the postmodern period of art without mentioning Andy Warhol. Warhol turned away from contemporary culture in 1980 with an exhibition at the Jewish Museum of Paintings titled “Ten Portraits of Jews of the Twentieth Century.” The international array of individuals included as subjects among the group Warhol labeled his “Jewish geniuses”—Sarah Bernhardt, Louis Brandeis, Martin Buber, Albert Einstein, Sigmund Freud, George Gershwin, Franz Kafka, the Marx Brothers, Golda Meir, and Gertrude Stein—represented various areas of the arts, education, entertainment, law, politics, philosophy, psychology, and science. SaAndy Warhol was an American artist who was a leading figure in the visual art movement known as pop art. Andy Warhol’s works explore the relationship between artistic expression, celebrity culture and advertisement that flourished by the 1960s. Andy Warhol’s Marilyn and Andy Warhol’s Soup Cans are some of the most recognized and collectible of his artworks. From Andy Warhol Paintings to Andy Warhol Prints and unique pieces, the artist’s works are available for sale from Guy Hepner.